Tibetan Community of New York & New Jersey (TCNYNJ) is a 501 (c)(3) not-for-profit organization focused on supporting the survival of Tibetan culture and identity, and to enhance the quality of life for all Tibetans living in the local community and worldwide. We offer our support of Tibetan-based educational, cultural and religious programs, while also reaching out to community members in need. While we are committed to building strong relationships within the Tibetan community through organizing events that will allow members to connect and reach out to one another, we also embrace our relationships outside the community through creating and organizing awareness campaigns. 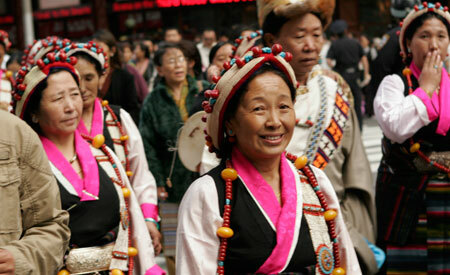 The continuity of Tibetan faith and identity is paramount. Tibet belongs to Tibetans, and is the home of Tibetan Buddhism and a zone of peace. It is incumbent upon all Tibetans to help one another and to support the community and its members must maintain the teachings of His Holiness The Dalai Lama, with particular emphasis on kindness and compassion. We must appreciate and accept diversity in our community. It is important to generate awareness of Tibet’s dire situation and work tirelessly to seek help from outside the community. Currently we are using voluntary services and rental spaces in scattered locations and on an ad-hoc basis to provide current educational and cultural programs. For example, our weekend language and culture program for Tibetan children, with over 180 enrolled students, takes place in rented space in Manhattan. Larger performance and conference venues are rented in different locations in Manhattan and Queens. The disparate rental locations and frequent relocations are disruptive to programming, particularly for children, and thus the urgent, practical need for a permanent community center is clear. Tibetan Americans are demonstrating a growing interest in preserving and sharing their unique cultural heritage, both for the benefit of our children as well as for the community at large that has generously taken us in as immigrants. While we have confidence in the strength of our culture and its values, we also want to be proactive and bolster our distinct cultural heritage to ensure its longevity for future generations.